“This…is…Jeopardy! Now entering the studio are today’s contestants…” With these words, announcer Johnny Gilbert began an episode of the popular nationally syndicated game show. What was unique about this episode? For one thing, one of the contestants was 11-year-old Ben Schwartz. While watching a “Kids’ Week” edition of Jeopardy! 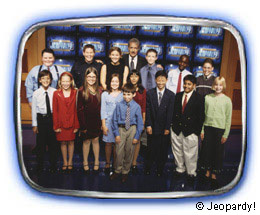 sometime in late 1999 or early 2000, Ben, a longtime fan of the show, heard Johnny Gilbert announce that Jeopardy! would be holding auditions for the normal adult version of the show and the “Kids’ Week” editions in Boston, Massachusetts in spring 2000. Because the “Kids’ Week” featured contestants between the ages of 10 and 12, and because Ben was precisely 11 years old at the time, he decided to sign up online for a chance to audition. The auditions were held in a conference room and ballroom complex inside a downtown Boston hotel. Over 100 kids were packed into a room with several television monitors. 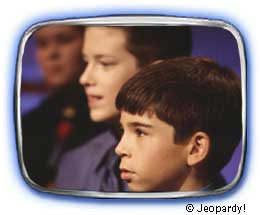 A videotaped Alex Trebek delivered a short introduction, and then, a number of Jeopardy!-style “answers,” on the order of 40 or 50, were successively shown on the screen. It was up to the 100 or so kids to write down the correct “questions” on their answer sheets. These answer sheets were then graded by the Jeopardy! staff in Boston in a time span of about an hour. About 10 top scorers would move on to the next level; the rest would simply be sent home. Ben Schwartz was a top scorer. So he and the other top scorers participated in the next level: A mock game, complete with the infamous buzzers. This gave the Jeopardy! crew a chance to see not just who was intelligent, but who had stage presence and personality. In August 2000, Ben was flown into LAX (Los Angeles International Airport). The star treatment began almost immediately, for Ben was whisked to Merv Griffin’s hotel, the Beverly Hilton. (Not coincidentally, Jeopardy! was created by Griffin.) Ben took in the sights and sounds of Beverly Hills, even dining at Wolfgang Puck’s famed restaurant, Spago. 30 minutes of fame. The most celebrated quiz show on television. The majesty and mystique of the Jeopardy! soundstage and its Canadian-born king. The intensity and the pressure. Besides invaluable experience, Ben gained something else that day: A Hawaiian vacation and a little, just a little, spending money to go along with it. Ben was finding himself increasingly comfortable in front of the camera and a national television audience.